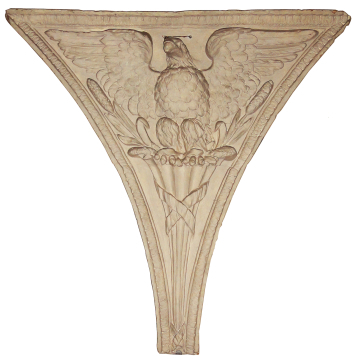 This object and its pair (M282) are spandrels in the form of eagles from the grand staircase of Carlton House, fronting Waterloo Place, just off Pall Mall. It was rebuilt as the Prince Regent’s London palace by one of Soane’s early teachers, the architect Henry Holland (1745-1806) between 1783 and 1796. The staircase was oval in plan with eight of these eagles between semi-circular headed openings in the walls, two of which contained figures holding a clock and a wind-dial. Carlton House was demolished in 1828, when Soane must have obtained these eagles.